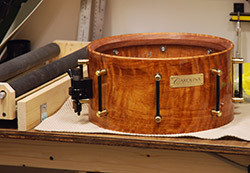 If you'd like to have a Carolina Drumworks snare or kit custom made for you, there are a few steps we recommend as the best process for getting you to the end result you're looking for. The first is contacting us by email or phone to begin the discussion. We'll prompt you with questions to help us work together with you on the design. It's important to realize that there are many small details that can work together on a drum's function and character, or they can work against one another and defeat the success of the build. Our initial discussion will primarily be about goals -- how you want the drum(s) to sound, feel, and look. We'll also talk about how and where you'll be using it. Then we'll make recommendations based on that discussion -- dimensions, shell species and construction, edge profiles, hardware design, and more. Many of the smaller details we can just take care of, making sure that they support your goals. There are also some items that we'll specify based on selections that meet our standards -- things like lug design and metals, vent position, or finish options. After that, we'll send you a written quotation for you to look over as verification of the decisions we've reached together. If everything looks right, you'll give us an approval and a deposit to get the project underway. We've found that the key to a successful build is good communication in both directions. We view a custom drum build as a joint customer/builder project and we strive for a great overall experience for everyone involved.